Click or Twitch? Take advantage of one of our team skippering ‘Gull’ while you take photos or just enjoy the view. 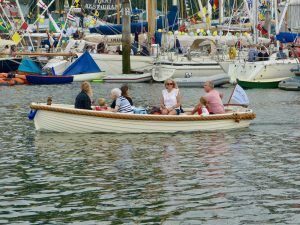 Project Gull was conceived to allow people to explore the beauty of the River Hamble who did not own their own boat, obviously we needed a boat and electric power seemed a green and nicely quiet way to explore. So the old Hamble ferry has been reborn. From our base in Swanwick Marina we are positioned nicely in the centre of the easily explored River Hamble. Gull seats a maximum of 12 although 8 is probably more practical and is electric powered and easily helmed. Together with my cousins and of course Millie we hired Gull the revamped Hamble Ferry from Hamble River Boat Charter. She is beautiful with a quiet electric engine to cruise the river. Took me back years riding in her, I remember well Ray driving her backwards and forwards across the River with bikes across her bow. With virtually no draft we got nearly up to Botley Mill and then had a stop off at the Horse and Jockey. Had a lovely picnic on the banks of the River which I love so much before returning to the berth. I would recommend hiring Gull I will be doing so many more times to play swallows and amazons. Gull is available to charter Bareboat or Skippered please look at the options and prices below. To charter Gull Bareboat, boating experience is required and we will require a £200 security deposit, which is refunded on return of the vessel undamaged. Not sure how to skipper Gull yourself then we have the solution, you can have a skipper come with you, they all know the river well, the best spots depending on the tide and you can have a free mini lesson on boat handling thrown in. Contact us for more details. To book your charter please fill in the form below with your requirements and we will contact you shortly, alternatively give us a call. ©Copyright Hamble River Boat Charter 2019, Website by Angelfish Creative Design Ltd.